Discover how Dacorum’s largest Roman villa evolved | The Dacorum Heritage Trust Ltd.
Dacorum has the sites of several Roman villas within its boundaries but the largest of them was discovered in 1963 when the new Leighton Buzzard Road cut through its outer walls. The villa is located on the slopes of the hill above the river Gade near Galley Hill. It covered an extensive area of about 900 square metres with a large bathing pool lying off on its east side, part of it lying under the modern road. Excavations were carried out under the direction of Dr David Neal, FSA, between 1963 and 1968 with the greater part of the costs being borne by Hemel Hempstead Borough Council. The excavation revealed that there had been a series of seven periods on the site. The earliest phase, Period I, was a timber house built around AD 75, only 32 years after the Roman Conquest, and it had a three-roomed bathhouse nearby. A little later, in Period II, some additional services were added to the bathhouse. Later in the second century (reign of Antoninus Pius, AD 138-161, Period III) the timber building was demolished and a new winged corridor house built, using masonry and having upper storeys on the south-east wing only. The lower level was a semi-basement. A new wing was constructed on the west side of the bathhouse. In Period IV farm buildings were constructed on two sides, forming an outer courtyard and the bathhouse was enlarged. In the early fourth century (Period V), the villa was extensively modernised by the addition of rooms, new farm buildings and a gatehouse. The improvements included connecting the bathhouse with the villa. 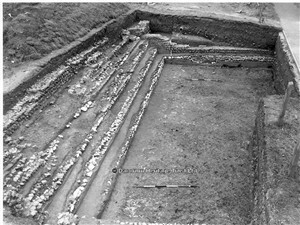 By around AD 325 (Period VI) a large bathing pool had been added to the bathhouse, its huge scale suggesting that it might have become the primary attraction of the establishment. The bathing pool, 12.20m wide and 20.98m long (40ft x 68ft 6ins) is the largest private pool known in a Roman villa in England, and only slightly smaller than the Great Bath in the temple at Bath (Aqua Sulis). Five broad steps led down into the pool. Only a few years later, in the mid-fourth century (Period VII), the baths and the villa appear to have been deliberately demolished because stockades and cattle pens were built over the earlier buildings. Occupation continued until the late fourth and possibly into the early fifth century AD. The destruction of the villa and the termination of dating evidence from coins appears to coincide with the end of the reign of the usurper emperor Magnentius (AD 350-353). It has been suggested that the owner of the villa may have been pro-Magnentius and suffered the consequences of being on the wrong side. Dr Neal returned to the site in August 2000 as part of a millennium project to clear up a few outstanding questions. What had originally been thought to be an external chalk floor was proved to be the floor of a timber round house; a porticus linked the villa with the baths and, most remarkably, evidence was found for a possible bathing pool predating the great swimming pool. Volunteers from the Berkhamsted and District Archaeological Society carried out the later excavations and funding and support came from Dacorum Borough Council and other local firms sponsors. 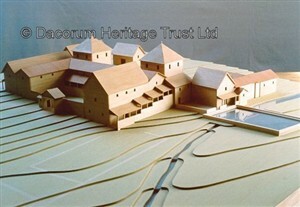 A scale model of the villa in its hey-day was made and is held in the Dacorum Heritage Trust Museum Store, and the site has returned to grass land. 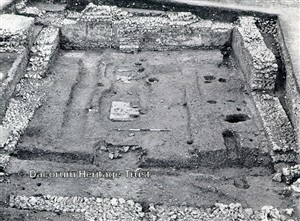 The 1963-68 excavations were published as a large Research Report of the Society of Antiquaries in 1974, and the later excavations in The Antiquaries Journal, vol. 81, 2001.